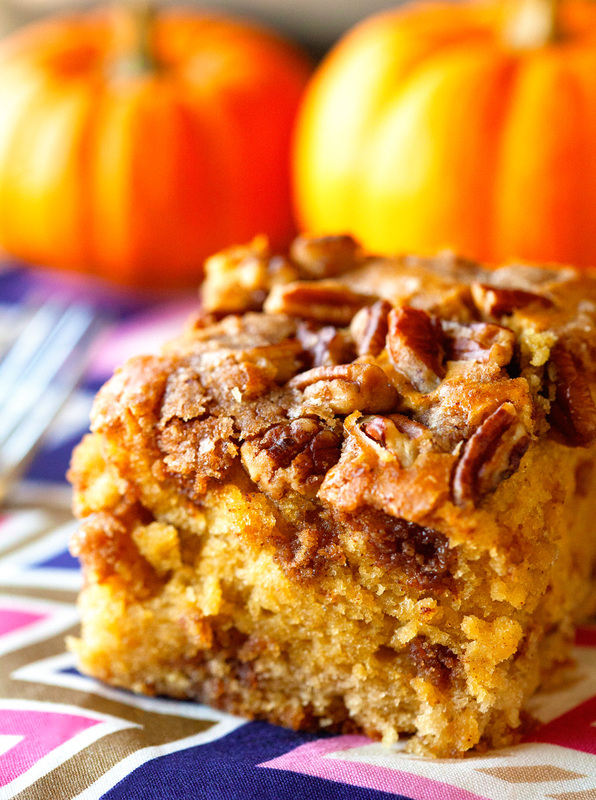 Melt in your mouth Pumpkin Coffee Cake. Grab a cup of joe and dig in. This is the perfect thing to enjoy on a chilly fall afternoon! Happy October 1st. Fall is in full swing and there’s nothing I love more than to snuggle up, sip on a warm beverage and snack on something yummy. Preferably while holding a piggy. Say what? 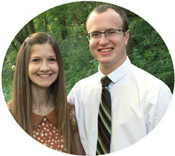 I shared yesterday in this post that Adam and I adopted two baby guinea pigs. It really was a spur of the moment decision. Somehow we ended up at a pet store on a Friday night and before we knew it, we were holding two piggies. Once we held them, there was no turning back. Pippa and Pippin had found a new home! I had no idea that guinea pigs are fruit and vegetable fanatics. More vegetable than fruit, really. Watching them chowing down on peppers, carrots, kale, and cucumbers has really inspired me to do the same. I am not kidding – when you watch them get so excited about their “treats” that they can’t help but run around in circles in their cage, I start reaching for carrots without even knowing it. Need to add more veggies to your diet? Get a guinea pig or two ;). While I love vegetables, there is something else that has me skipping with joy around our house. 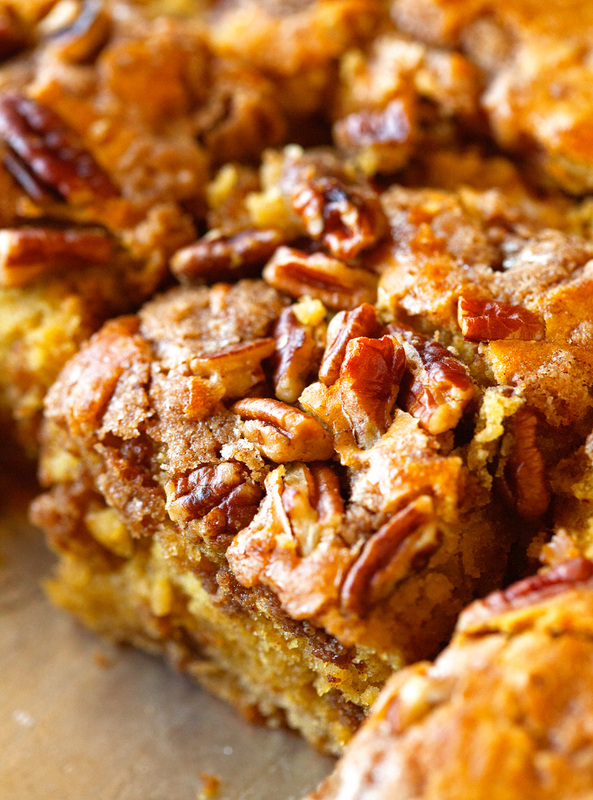 3 words: Pumpkin Coffee Cake. Since this is the season of the Pumpkin Spice Latte or PSL, I really wanted to make something that compliments fall’s favorite drink. Pumpkin needed to be a key ingredient, of course. And so was a buttery, crumbly and cinnamon-infused topping. The aroma this cake sent through our house was almost too much for me to bear. While it finished baking, I just had to distract myself by making a homemade latte. I knew I wanted a warm slice of this cake as soon as it came out of the oven to enjoy with my freshly brewed cup of yumminess. This cake clearly hit the spot. I cleared my plate within seconds. One thing I love about this cake is how high it rises. Definitely not for the faint of heart, but oh so satisfying and bursting with the flavors of fall. Yummm! I think it’s calling your name! 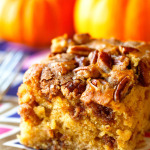 Pumpkin Coffee Cake that is super moist and flavorful! This crowd-pleasing recipe is a definite keeper. Preheat oven to 350 degrees F. Spray a 9-inch square cake pan with nonstick spray. 1. Start by preparing the crumble topping. 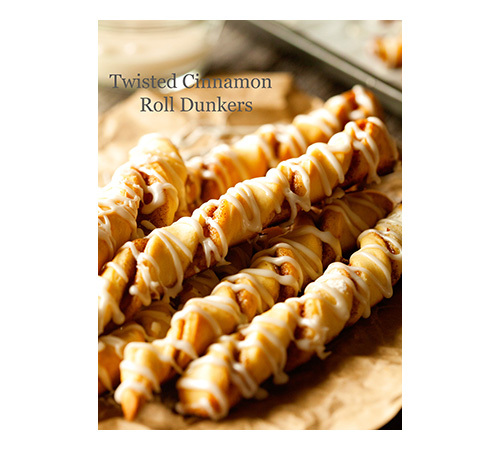 Mix together butter, brown sugar, flour, pumpkin spice, and cinnamon until coarse crumbs form. Set aside. 2. In a medium bowl, whisk together pumpkin pie spice, salt, baking powder, soda and flour. 3. In the bowl of your stand mixer, cream together butter and sugars. Add eggs, one at a time, and mix until incorporated. Add milk, heavy cream, and vanilla and stir to combine. Add pumpkin puree. Slowly pour dry ingredients into the wet and stir until fully combined. 4. Pour half the batter into the prepared baking pan. Top with half of the crumble topping and pour remaining batter on top. Sprinkle with remaining crumble mixture and pecans (if using) and place in the oven. 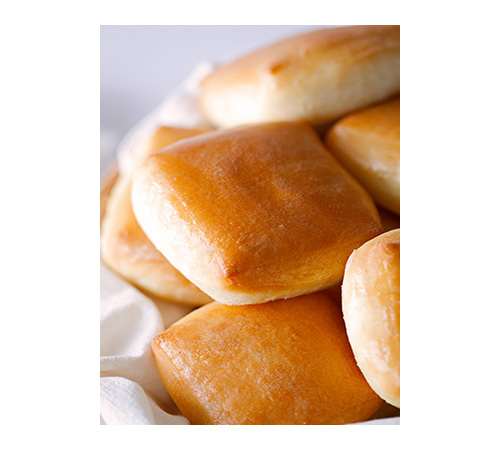 Bake for 60-70 minutes or until a toothpick inserted in the middle comes out clean. Let cool before cutting into slices. Pumpkin Coffee Cake will keep up to 3 days stored in an airtight container. 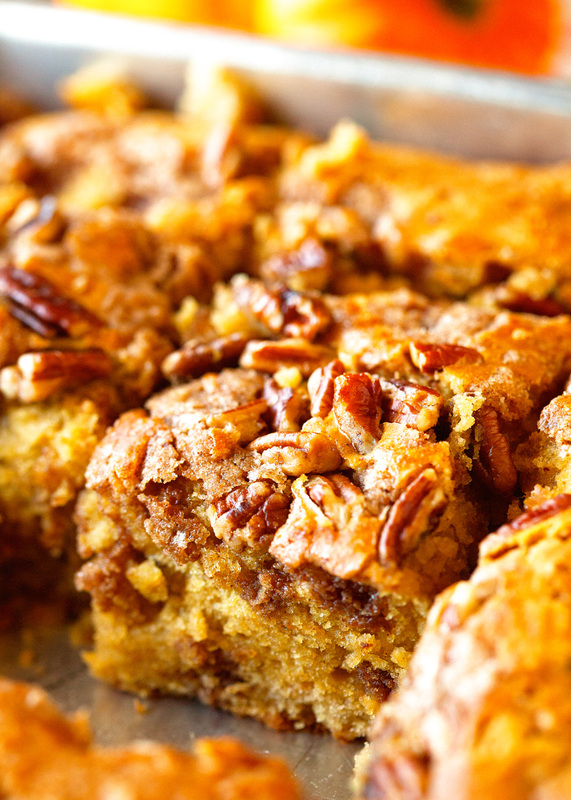 Pumpkin coffee cake sounds like the perfect fall breakfast! And I’m loving that crumble topping. Makes this cake even better! I could eat this cake all day long. Thank you so much, Gayle! It looks delicious! Can i use whole wheat flour instead of all purpose flour? 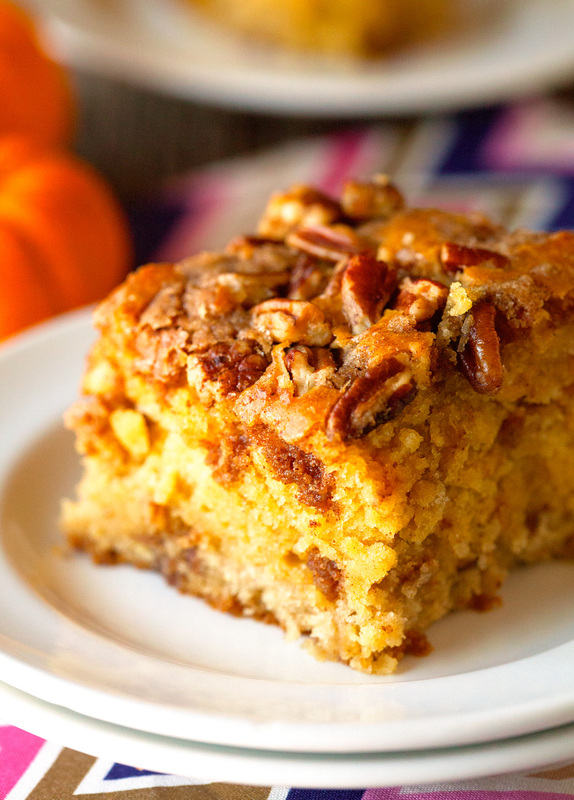 Pumpkin coffee cake?! I would be jumping around the house too!! Love and pinned!!! going to check out your other post now so I can see your new baby guinea pigs!! My kids want a pet and a guinea pig might be easier for now than a dog. Thank you, Alice. Guinea pigs are actually super easy to take care of… the perfect starter pet ;). We love our piggies! 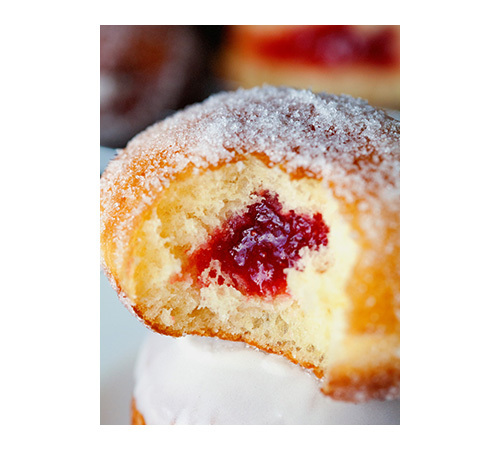 I’d love to have a giant slice of this with coffee for breakfast (or dessert! 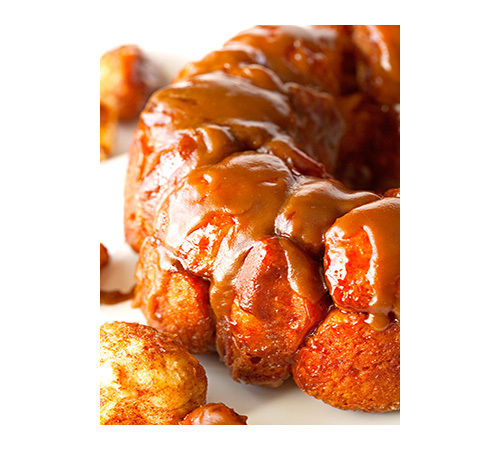 )…perfect for the beginning of fall, looks delicious! 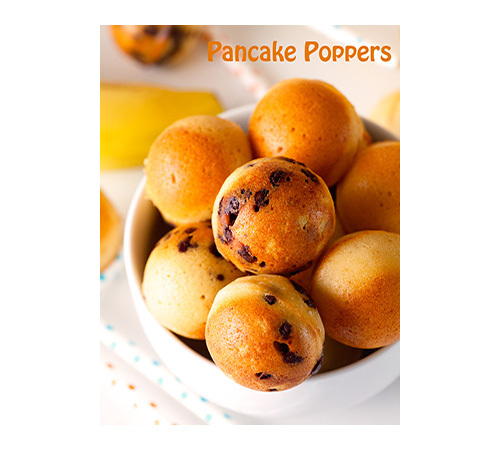 You can definitely enjoy this for breakfast or dessert ;). Thank you so much, dear! I’m so excited for all the pumpkin recipes – ESPECIALLY this one. Sounds like your house smelled just perfectly fall. Congrats on your new furry pets! Aww, thanks. I couldn’t stop eating this cake! We love our new pets – they’re so sweet! This is probably the best looking coffee cake I have ever seen.. it looks so incredibly moist and packed full of delicious sweet flavours. 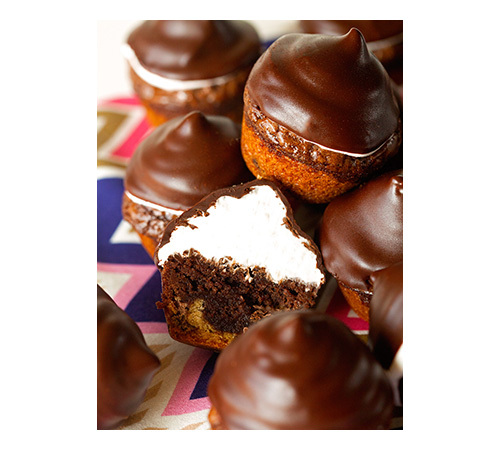 Great recipe, you can definitely consider that I will be recreating it! Just looks delicious, Kathi! I am so in love with fall flavors right now, and this one has them all 🙂 Lovely color as well! If this doesn’t look like the perfect way to start out a fall Sunday morning, I don’t know what does! We love coffee cakes in our family and this unique one will definitely have to make it into the rotation. Wow, that is one tasty-looking coffee cake. I would definitely go for the pecans in my topping, so yummy! Gorgeous and delicious per usual. I feel like this would be perfect for breakfast on Thanksgiving morning. Pinning!! So fun that you adopted guinea pigs! I had one when I was little. I loved the little squealing noise it would make when I would come home because he was happy to see me. And they do love their veggies! Such healthy little fellas. 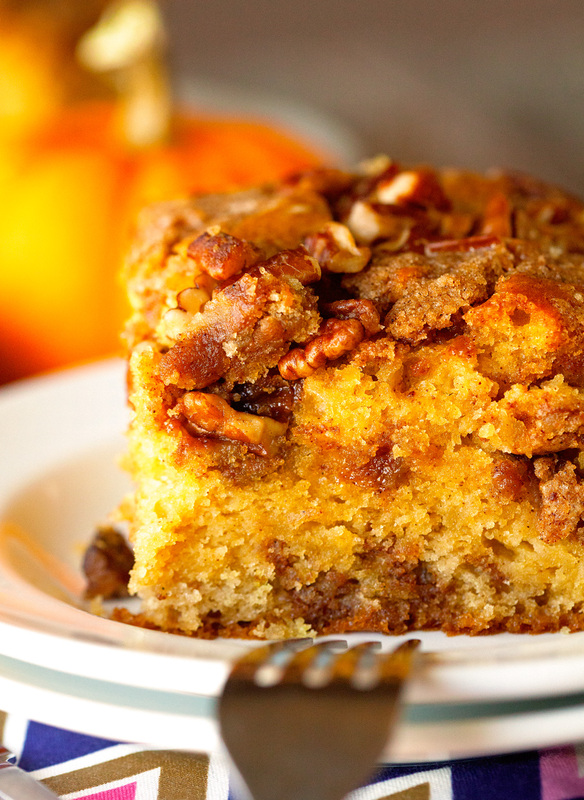 Kathi, this pumpkin coffee cake is making my pumpkin dreams come true. 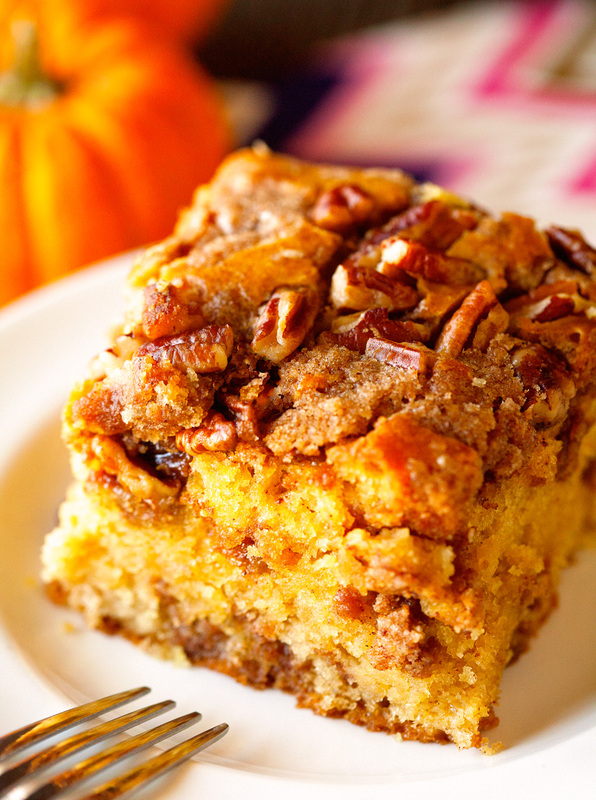 Can you imagine if I had a pumpkin spice latte AND this pumpkin coffee cake?! Kathi, you owe me a new keyboard because I just drooled all over mine. Wow, girl! 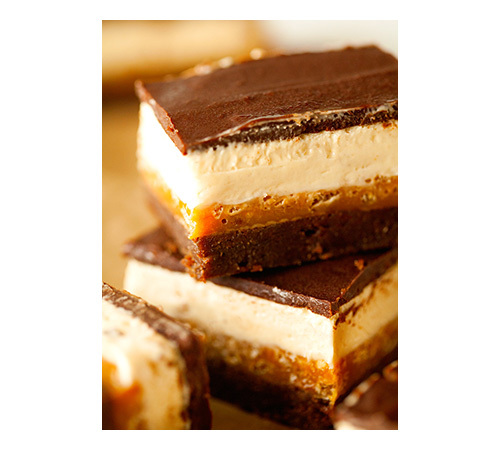 Those moist layers look amazing. And CONGRATS on the guinea pigs–we used to work with over three dozen at the zoo and I would herd all the baby guinea pigs into their carriers to be transported to their big island. They must be the cutest creatures in existence! Your comment totally made my day, Ala!! Guinea pigs are my favorite. I could snuggle them all day long ;). Thank you so much!! They definitely are ;). You are the best, Alyssa. Thanks for making me laugh – I so wish I could drop by and share a slice or two with you! Can you double ingredients for a 9×13 pan? I’ve never tried that, but I think so. I’m so excited to make this! I love love love coffee cake. 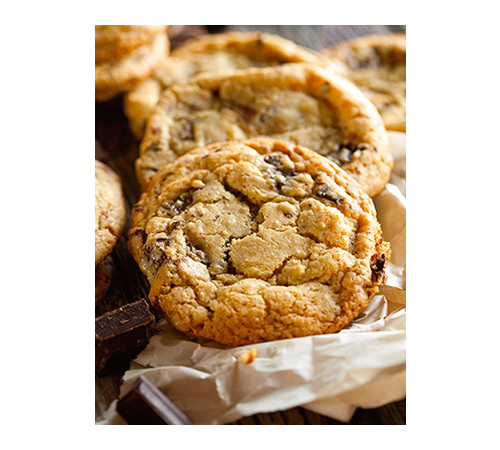 And I love love love to share it away – could I easily just double this recipe to fit a 13 x 9? You and me both, Sarah. I am not 100% sure as I’ve never tried that, but I would imagine so. Thank you and I hope you enjoy! Thanks for your response! I’ll give it a try. This is a delicious coffee cake, but I would suggest a 9″ x 13″ pan rather than a 9″ x 9″. I made it twice, thinking I did something wrong, and it overflowed both times. I thought when I read it that it was impossible to fit in a 9″ square with 3 cups of flour (I bake quite often). I think it is a mistake & should be 9×13. How is the recipe? sounds delicious! How fun that you have two new little buddies! And what a beautiful cake… I’m throwing a baby shower brunch for my sister and I’m thinking this would be so perfect! Just made this. Followed recipe exactly. There was considerably too much batter for a 9X9 pan. I dumped it into a 8X13 and it filled it to the top. I dumped it into a 9X13 and it looked low but it baked up to the top perfectly. The topping is not crumbly because there is too little flour for 1/2 cup of butter. Only had to cook for 40 minutes. Oooooh, this looks good! The perfect way to eat pumpkin! I clear my plate in second, for sure. I love pumpkin and will be giving this a try… but I was wondering why the unsalted butter. Is that a must have or can you use salted. I just discovered your site through “Hooting holler” and the temptation of this yummy Pumpkin cake and its spicy crumble…Miam! But please I need help . What do you call “Pumpkin -pie-spice” Here in France we do not have this institution of pumpkin pies or cakes, as you have in the USA. Would they be a mix of cinnamon -cloves -muscade nut?… Thank you for your answer! And a very good day to you all.******! Yes. I updated the recipe. Thanks for letting me know! Any idea if this could be made in advance and frozen? Kathi, what a wonderful recipe! Can’t wait to make it for the kids. How are the guinea pigs?! This looks so good. Have to make it this weekend. Will let you know how it turned out. I don’t have a 9 inch square pan. Should I use an 8 inch, or a 9×13 pan? Thanks! What can I use in place of Heavy Cream?